Today we noticed that an individual sent a tweet to The Rapid asking “what is your cost per rider to the taxpayer?” In response, The Rapid tweeted back that their cost to transport one passenger was $2.87 in 2010 and that the regular fare is $1.50, therefore the cost to taxpayers is about $1.37 per passenger. The Rapid’s twitter links to their 2010 National Transit Database fact sheet, the same that we host here, as proof of their numbers.The Rapid is hoping that you don’t look too close at their own data because you will see the real cost to taxpayers of their service. A simple glance at the top of the page will show you how wrong The Rapid is. Passenger fares only cover 15% of operating costs. On top of that, The Rapid wants you to ignore its capital costs. We’ve pointed out over and over that The Rapid likes to pretend that a very large portion of its (taxpayer) funding and spending shouldn’t count, but that’s not how accounting works in the real world. For those of our readers who are not familiar with the difference between operating and capital costs, operating costs are generally those things that are ongoing, such as salaries and gas. Capital costs are generally durable things, like buses. The Rapid is basically saying that you shouldn’t count the cost of the bus itself when determining what it costs to transport passengers. This is like a car dealer only telling you the cost of gas for your car and not the cost of the car itself when shopping around. Let’s go back to the NTD fact sheet. If you browse down to the section under “Modal Characteristics – Mode” and look at the line that says “Bus,” you’ll see the total costs of The Rapid’s bus service (see below). 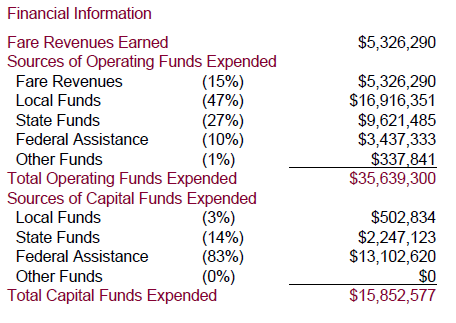 Operating expenses in 2010 were $26,750,657 and capital expenses were $13,066,136. Total bus fares received were $4,404,701. Total “unlinked trips,” or rides, were 9,307,111.Â Using these numbers we can see the true costs of The Rapid’s bus service to taxpayers. If we add operating and capital costs ($26,750,657 plus $13,066,136), we get a total cost of $39,816,793. Divide that by the number of rides and we see that it cost The Rapid $4.28 per passenger. We can also divide the total amount received in fares by the number of rides, and we see that the average fare was just $0.47. This means that the total cost to taxpayers of The Rapid’s bus service is $3.81, or nearly three times more than the false information that The Rapid tweeted today. In fact, when we add up the total operating and capital budget of The Rapid system, we see that fares only account for 10.4% of revenues ($5,326,290 of $51,221,877). Nearly the entire rest is picked up by taxpayers. We’ve also previously pointed out that The Rapid’s capital costs are unusually high for a transit agency. For instance, the Lansing bus system gets a much bigger bang for its buck, and spends less doing it. ← Does The Rapid bus system have a $100 million impact on the local economy? Nope, more made-up numbers from The Rapid.